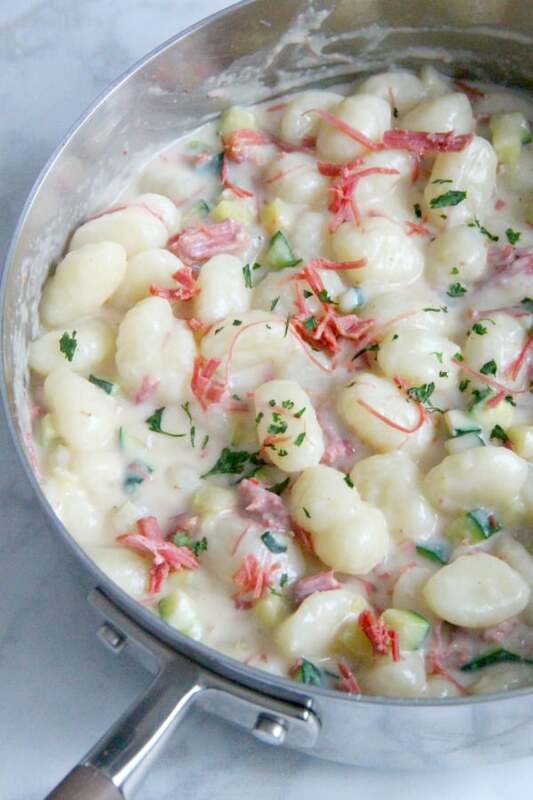 Creamy Gnocchi with Corned Beef and Zucchini is perfect for using up that leftover corned beef! It only takes about 20 minutes to put together! My favorite thing in the world when it comes to cooking is when I can make something and use it for one or two meals! So I made this really easy instant pot corned beef recipe last week! And now this week I am repurposing some of that leftover corned beef and making a whole new dish! 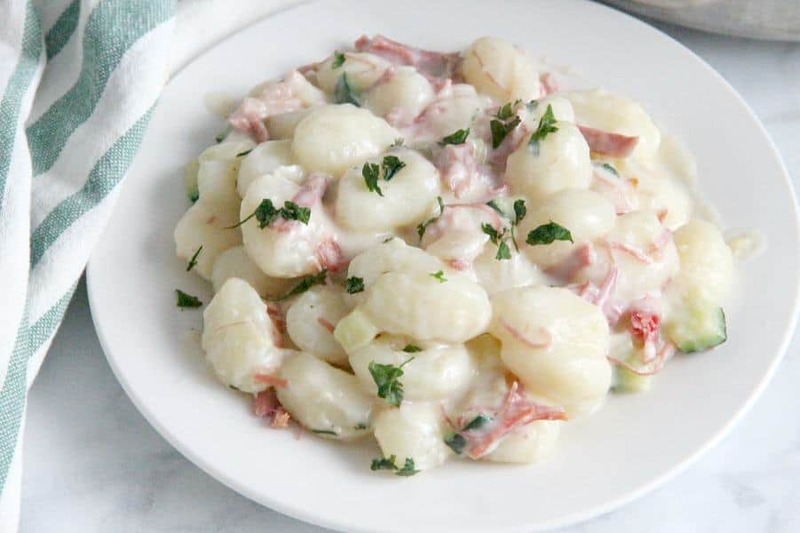 To make this Creamy Gnocchi with Corned Beef and Zucchini you will need to follow a few steps but they are easy so I shouldn’t be to difficult. 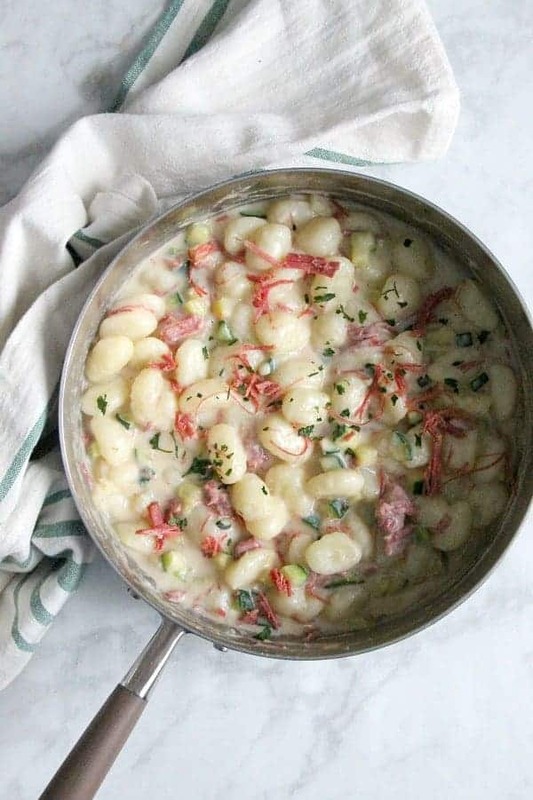 Make sure you make your gnocchi first. 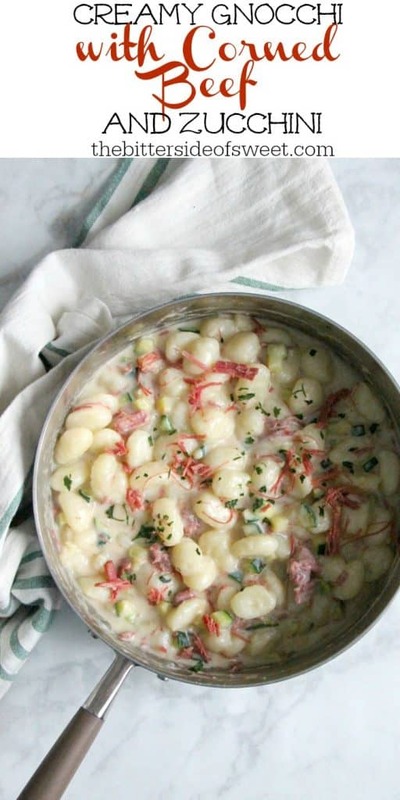 Your sauce will come together pretty quickly so you want to make sure the gnocchi is done. I always save my hot water and put the gnocchi back in right before I drain it. This helps heat it back up and separate it, in case some pieces get stuck together. 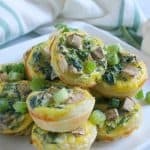 You do not necessarily need to use zucchini any vegetable would do. I just happened to have this on hand so it worked for us. When I want to make a dish creamy I always start with a roux. 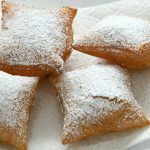 What exactly is a roux? Basically it’s butter, flour and milk! 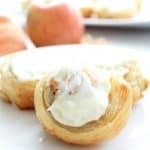 It is so simple and easy to make. It’s used to help thicken sauces. It is also very forgiving if you happen to mess it up a little, like I do! 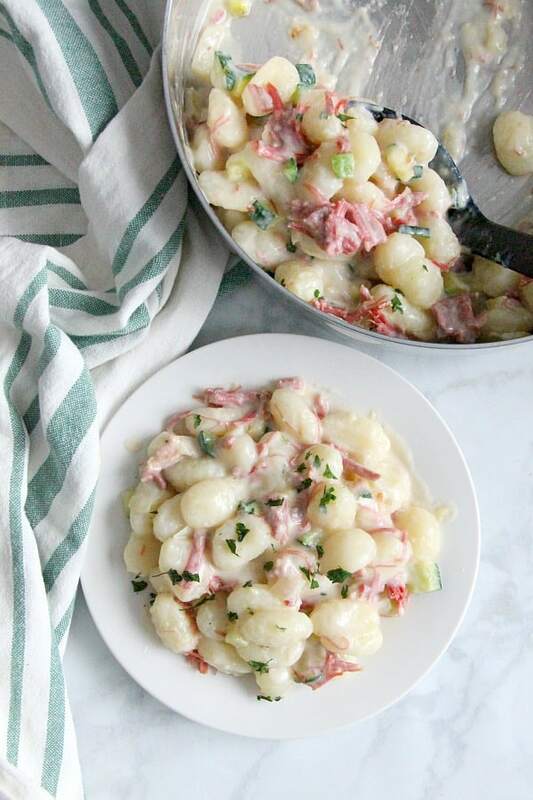 Using leftover corned beef to make this quick and easy Creamy Gnocchi with Corned Beef and Zucchini! 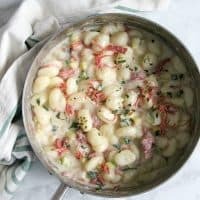 Cook gnocchi according to directions. Set aside. In pan add olive oil, onion, zucchini, garlic powder and salt. Saute for 5 minutes or until zucchini is soft. Remove from pan. In the same pan add butter and melt. Whisk in flour. 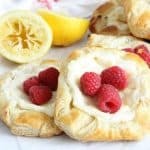 Slowly add in milk and whisk until creamy. Stir in zucchini and corned beef.